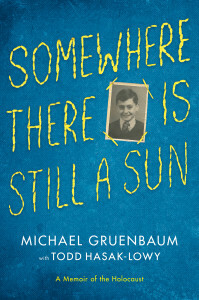 Todd Hasak-Lowy is the author with Michael Gruenbaum of the new memoir Somewhere There Is Still a Sun, which recounts Gruenbaum's experiences during the Holocaust. 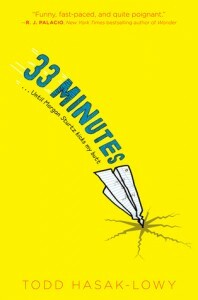 Hasak-Lowy's other books include the middle-grade novel 33 Minutes. 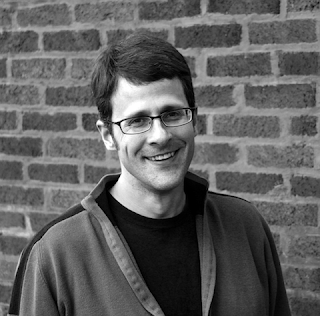 He teaches literature and creative writing at the School of the Art Institute of Chicago, and he lives in Evanston, Illinois. Q: How did you end up working on this book with Michael Gruenbaum, and how did the two of you collaborate on the project? A: In 2013 I published a middle-grade novel, 33 Minutes, with Aladdin, which is an imprint of Simon & Schuster. They had acquired the rights to Michael’s story around that time, and had someone else working on the book who did two drafts. But it wasn’t working out, so they approached me. The narrator of 33 Minutes is a seventh-grade boy, so they knew I could do a boy’s voice (Michael was born in Prague in 1930, meaning he was a boy during World War II). And I used to be a professor of modern Hebrew literature, so they were confident I could get up to speed on the historical setting. It wasn’t something I was initially very interested in, but in the end I agreed to do it. So first I went to meet Michael, who lives in suburban Boston. We spoke for a couple days, and I left there with a stack of books and documents, including a 40-page narrative for children he wrote in the voice of the bear [which appears in the book]. He had tried to sell that to publishers, and that’s how he ended up reaching Aladdin. They asked him if he’d sell the rights to his story, in lieu of publishing what he had written. Having read the last draft by the previous writer, along with Michael’s bear narrative, I had the skeleton of the story. The real collaboration started once I began writing in earnest, because then I suddenly had many more specific questions. I would send Michael questions on a daily basis. These questions were now very specific—what did people eat, what did they wear, how often did you see your family when you were in Terezin, etc. And, of course, Michael read the full draft, gave me many notes, and certain changes were made. Q: You mentioned just now, and you also note in your Afterword, “I didn’t want to work on this project when I was first given the opportunity.” Why was that, and what changed your mind? A: Because of the historical events in question—along with Michael’s experiences—I want to acknowledge that this is a delicate matter. Before writing this I obviously felt that the Holocaust is a hugely important event, and one that needs to be remembered. But I was also somewhat cynical in the sense that I thought we were doing a more than adequate job of this, in terms of the number of books being published on the topic. So I didn’t much think my energy needed to be devoted to contributing this, and I also wasn’t sure I had anything new to say. Not to mention, I had my own projects I was working on. So, all in all, at the beginning I took this on with a certain amount of ambivalence. Why did I take it on at all? Largely because my agent, Dan Lazar, thought it could be a great opportunity for me, in part because it was another chance to work with my incredible editor, Liesa Abrams. Something amazing happened once I started writing Michael’s story, which was that through the process of putting it into words I found myself relearning the subject. Because my earlier cynicism was inseparable from my arrogant sense that I knew the Holocaust to such an extent that I could, more or less, disregard it—or at least engage it from a distance. Indeed, this is something I think many of us do. Many of us go deep into studying the Holocaust not long after we first learn about it. I did that myself, probably 25 years ago. But then you back off, or at least I did, at which point the Holocaust is reduced to a bunch of highly abstracted ideas. I think this is understandable to a large extent, since it’s quite difficult to engage it fully on a day-to-day basis. Writing this book forced me to return to the thing itself, to reconsider it as it was in all its three-dimensional reality, as I wrote about it in the present tense, from the perspective of a child. By the time I was done, there was nothing at all abstract about it for me anymore. And I’m hugely grateful for that, and more than a bit humbled by it. Q: How did you research the book, and what surprised you most in the course of your research? A: I read quite a few books about Terezin, as well as histories of the Jews of Prague and what happened to that community following the Nazi invasion. Many of these books were given or recommended to me by Michael, but I also tracked down some titles on my own. Two books were particularly crucial to the kind of material I needed to write the book as I did: ABoy in Terezin: The Private Diary of Pavel Weiner and The Terezin Diary of Gonda Redlich. These two diaries—one kept by a boy who was in Michael’s room in Terezin, and the other kept by the man in charge of all the childrens’ rooms there—gave me a much clearer sense of day-to-day life in Terezin, which was not easy to find. The standard historical stuff—key dates, the bios of the leadership, the raw numbers—these weren’t hard to find. But what was a “regular” day in Terezin like? And how were people making sense of their lives there as they were unfolding? This is what these diaries told me. And Pavel’s diary told me something else just as important, because—and there is something really amazing about this—I’d say that 85 percent of his diary is devoted to two things: First, the details of his love-hate relationship with his best friend. One day he would complain about him endlessly, and the next day he’d be detailing how they made up. 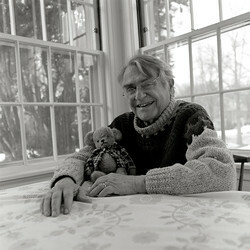 Second, Pavel was an aspiring intellectual and writer, and he made regular contributions to a newspaper, Vedem, edited by boys from another room. Many of Pavel’s entries detail his latest piece and his preoccupations with it. Pavel’s diary reassured me regarding a hunch I had from the beginning. Namely, that even if you’re literally in the middle of a genocide, your day-to-day concerns don’t just evaporate, especially if you’re a child. What still matters most—at least much of the time—are your friends, your hobbies, and whatever smaller drama is unfolding on any given day. And I like to think that people can relate to this book precisely because it doesn’t deny this. Yes, the Holocaust was in many ways its own unimaginable universe, but it was a universe populated by regular people with regular concerns that didn’t disappear entirely. There was one other type of vital research I did for the book. I took a trip to Prague and Terezin. I didn’t originally plan to do this, but then I won a translation award—I translate from Hebrew to English—and the organization giving out the award offered to fly me to London for a ceremony. So I decided to add a trip to the Czech Republic in order to get a sense of what it felt like to walk the streets, what the buildings are like. Michael sent me a long list of places to visit, which helped me use my limited time very effectively. I wouldn’t have been able to write the book without this trip and the pictures I took there, as they helped me stage the scenes in what felt to me like real places. Q: What age group do you think this book would most appeal to? A: Officially the book is being marketed to readers ages 10-14. But one of the interesting things I’ve noticed since it was published—and I’m well past a small sample size here—is how powerfully adults respond to it. I think this goes back to my experience writing it, by which I mean that many adults read this book and find themselves truly relearning what they already thought they knew. A: I’m working on a couple projects. The first is a nonfiction book about how to read and write on fiction. This will be aimed at upper-level high school and lower-level college students. I teach literature and composition courses at the School of the Art Institute of Chicago, and my ideas about how to communicate these topics, especially to students lacking confidence in these areas, started to feel like a potential book to me. I also recently started writing a middle-grade novel that is partly in comic book form, which is funny because I can’t draw to save my life. But I’ve gotten very into graphic novels as a reader, and I’ve been teaching them as well, and trying to narrate through this form has been invigorating. I should add that writing Michael’s book has been a little disorienting, in the sense that it changed me as a writer. It was the first thing I wrote that was both utterly chronological and stylistically understated. My earlier books tended to involve a lot of formal and stylistic complexities. The writing called a lot of attention to itself. Michael’s book turned me into something of a minimalist (at least relative to my earlier work) and taught me to trust the story more. So I’ve been trying to find a place for this new approach in my own creative work.